There seems to be so much confusion with understanding Google Analytics that I thought it would be appropriate to devote a special series to it. Once I uncover the mystery surrounding its power, you’ll forever wonder how you lived without it. Throughout the series, I’ll reveal the proper way to install Google Analytics and explain what it can tell you once it has been successfully completed. Together they all play an important part in the entire “statistics overview”, yet each one can operate independently of the other. As such, each one also has their own unique and separate tracking code that needs to be installed if you plan to use it. Simply installing “Google Analytics” will not install E-commerce Tracking, nor will it install Conversion Tracking or Goal Tracking. These are separate entities within the entire analytics package. Ok, so now that I have pointed that out, let me explain the difference between the 4 main components. The “typical form” of a Google Analytics install is what I like to call the “Vanilla” (or “plain”) version. It is the one that you are given tracking code for by default when you create a Google Analytics account. The code you use to install Google E-Commerce Tracking looks something like this and MUST be placed BELOW the “Vanilla” Analytic Tracking code (shown above) on the sales RECEIPT page. This is the page a user arrives at after completing a successful sale at your store. Goal Tracking gives you the ability to track important events (actions/goals) that users take when they visit your site. Unlike the first three components that are available to us in Google Analytics, the Goal Tracking component does not require any special code other than the “Basic” Analytic Tracking code that I showed you in the previous post. The thing is, as with most of the Google Analytics Tracking elements, this one relies on more than just “installation of tracking code” to get it working. You can enhance Goal Tracking even further, to produce more powerful report data by creating what is called a “Funnel” to that Goal. By doing this, you will now be armed with the tools necessary to find out how effective the process leading up to an individual Goal really is. You will discover what flaws exist in the channel and where they are. In short, this will help you determine many things including, exactly at what point in your sales path users are abandoning the process. And as we all know, that is a critical element you need to know if you are to increase conversion. The Introduction is Complete. Now On With the Show! Ok, so I have introduced you to the 4 components that make up “Google Analytics”. The remaining parts of this series will go into more detail on each of the 4 pieces, explain how to set each up, give examples of such, and uncover how you can harness their collective power to help increase your conversion. Until next time; keep the traffic flowing, and the analytics recording. Part 2 of this series discusses “Vanilla” Google Analytics including setup and troubleshooting for installation. Yes, I have been answering questions on Google Analytics for some time now, and decided it would be best to put together a series that went over some of the most common elements. I have a number of things to point out I think every one will like regarding Google Analytics. Is the GA module on ZC download page able to do all the four things or just the basic tracking? It will not get you the rest. Those have to be manually added and setup in your Google Account. What you’ve outlined will allow everyone to track their site activity, sales, whats working/not working, and allow them to effectively drive traffic through Google Adwords. If you can get all of this working on your site (and more importantly, USE the data effectively), you are in great shape to grow your business and ahead of most sites you will see out there. Eric, in my GA site, I was told my GA account is UA-xxxxxxx. However in the following code, I found google use UA-xxxxxxx-1. Do you know which one I should use in the admin/configuration/Google Analytics Configuration? thanks a lot and have a good night! The Google account number should have the “-” (dash) in it. You can find your exact Google Analytics number by logging into your account and getting it from there. Thanks Paul. Yes, there seems to be a lot of confusion out there regarding the system. In general, I find this the same with many analytics systems. It is one thing to install an analytics system on your site. It is a totally separate thing t know WHAT that system is telling you. I intend on going over as much of that as possible in this series. 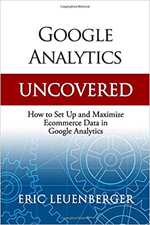 At the end of the series I will present Google Analytics Uncovered: The Workbook that will aim to help users better interpret what their analytics are saying so they can make more informed business decisions about what direction to take the online portion of their company.